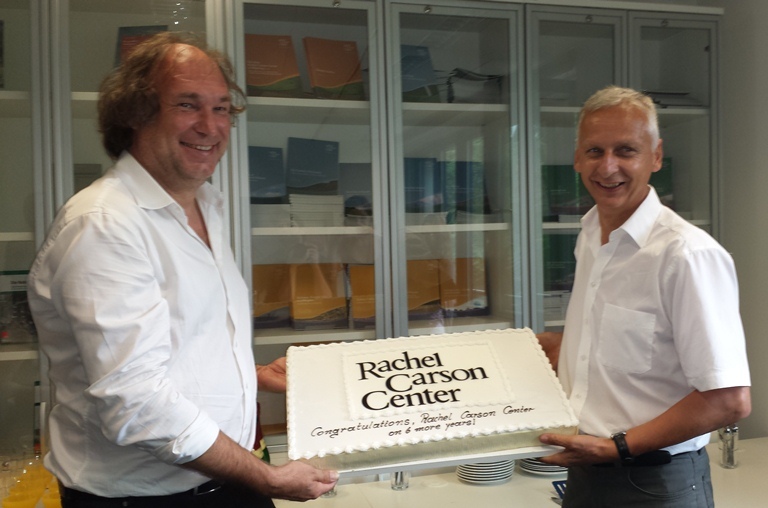 RCC Directors Christof Mauch and Helmuth Trischler celebrate the beginning of Phase II with staff and fellows. Last week, staff, students, and Fellows at the Rachel Carson Center celebrated the center receiving grant approval for its second funding phase, which begins today and is to last six years. The German Federal Ministry for Education and Research have awarded the RCC the maximum amount of funding possible. Phase II of the RCC will focus on “transformations in environment and society,” which questions the interrelationship between environmental and social changes, and in particular the reasons—social engines, political factors, cultural perceptions, and environmental conditions—behind these transformations. More information on this exciting new phase can be found on our website.